Moms do everything. Laundry, cooking, dinner, errands, even blog posts. 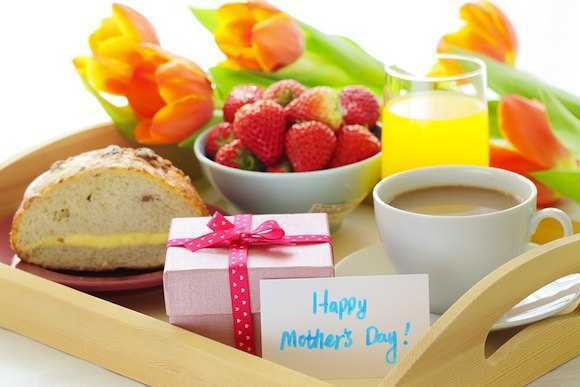 This year, remember your Mom and show how much you appreciate her by giving her one of the Top 5 Mother’s Day Gifts for 2013. The list below is in order of lowest to highest budget, so hopefully there’s something for everyone. Who doesn’t like breakfast in bed? Nothing says “I love you Mom” more than waking up to to the smell of fresh coffee, bacon and eggs (or whatever is your Mom’s favorite morning meal). Let your mom sleep in and surprise her with a tray full of her favorite goodies. You can even get fancy and decorate it with a hand-made card and flowers from the back yard. Making Mom breakfast in bed is a lovely way to show Mom how much you care. It’s also a gift from the heart that most young people can afford. Moms just love spa treatments. There is just something oh-so-wonderful about getting pampered, whether it’s a massage, facial or a simple mani-pedi. The very fact that someone else is taking care of her will send your mom over the moon. Most reputable firms have a gift certificate program so your mom can choose the services she’s most interested in after she receives your gift. Spa treatments can usually fit most budgets and generally range from $50 to $150. A lot of Moms are getting into Wii Fit. It’s a great way to get active during the winter months when it’s often difficult to enjoy outdoor activities. There are Wii Fit games for golf, tennis, and even skiing. The latest console plus basic software includes a balance board for $99.00. Mom can specify the amount of time she wants to spend on her workouts or select an area for personal improvement, and Wii Fit Plus will suggest a number of diverse activities for her. For even more variety, Mom can mix and match which strength or yoga activities she prefers on a given day. This makes it easier than ever to maintain her daily workout routines. You can also add accessories to spruce up the basic package, including an anti-slip pad, battery charger, and cover sleeve. If you’re close to California or Kentucky, you can get the game only in time for Mother’s Day for just $26.98 if you pay $2.99 for same day shipping or upgrade to 1 Day Priority Shipping. Or give Mom a card and let her pick out her own Wii Fit Plus Bundle. Speaking of spending, Mom will go nuts for an iPad mini. These little gems are showing up in purses all over the world, making it easier than ever for moms on the go to stay connected while staying involved in their children’s activities. The iPad mini is a full-featured iPad. Mom can choose from over 250,000 apps available online from Apple’s App store. It’s small, cute, and super-durable with a solid glass and aluminum construction. It’s more expensive than other tablet computers at $330, but the Apple pedigree and access to the zillions of apps in the app store should make just about any mom smile. While you’re at it, you can include a protective smart cover case in her favorite color. You can compare prices on iPad minis at The Find. Last but not least, flowers are a dependable Mother’s Day choice. But not just any flowers. Plan ahead and see if you can find out Mom’s favorite flowers without giving away your plan. Then call a reputable local florist, explain your budget and have them design a custom-made bouquet full of mom’s favorites. You might even consider placing the arrangement in a beautiful commemorative vase that Mom will enjoy for years. If the vase is made of silver, brass or stainless steel, you might consider engraving your mother’s name along with the date on it. Instead of a last-minute gift, you can turn this long-time standby into something truly memorable and special. So there you have it, the Top 5 Mother’s Day gifts for 2013. What other gift ideas do you have for this Mother’s Day? so get out there and get shopping! Regarding gifts for Mother’s Day, I’d like to make you aware of something totally unique and special: A photo calendar on your mom’s smartphone, featuring personal family photos – or whatever photos you like to be included in that calendar. How cool is that? Especially, watch the 5 minute video review to understand, how the calendar works. Please let me know, if you have any further questions, or need to know more details.